Few things fill our hearts with joy like pets, but there is a flipside to this – we worry about the furry members of our family just as much as we do our own children. There are certain things that should always be taking into consideration when animals share a house, and this guide will discuss how you can ensure your home is devoid of danger. If you’re bringing a pet into your home, or moving to a new family dwelling, you’ll need to ensure that no ill fortune will befall them. Here is some generic advice on how you can keep every member of your family safe, whether they stand on two legs or four. American Humane are dedicated to the safety of animals, and they have some great advice on how to keep inquisitive animals – including puppies and kittens – from getting themselves into trouble in the home. Family Handyman is a blog that’s packed with hints and tips for keeping a home safe for animals. Petful have bags of advice on keeping a home safe for a new, non-human arrival. Animal World go into some detail on all the hazards – be they in plain sight of hidden – that any pet will be able to locate in the home, while the The American Society for the Prevention of Cruelty to Animals (ASPCA) has collated a list of all poisonous chemicals that can be found in the home. OVO Energy is a UK-based electrical supplier, but the advice they on keeping pets safe from electrical hazards in the home is truly universal. The American Red Cross provides essential information on how to help your pets if there’s a fire in your home. PETA, meanwhile, offer guidance to how you can keep your pet safe during a natural disaster. Finally, Good Housekeeping magazine summarizes the ways that pets can place risks upon humans. General advice is great, but sometimes you need to be a little more specific. Let’s take a tour through each room you’ll typically find in a family home, and shine a light on what may be useful for keeping the vulnerable members of our family safe. The average living room will host a TV, a stereo, a video game console, and other electrical appliances besides. That’s a whole lot of cables potentially lying around. If you have dogs, cats, rabbits or small animals, you should ensure that no animals can chew through these wires. Blogger PetsLady has some suggestions on how to hide cables from your four-legged family members, and Apartment Therapy also shares some more general advice on this topic. First Tank Guide offers invaluable advice for anybody lucky enough to have a fish tank in their living room. You may love your array of indoor plants, but your pet may take a shine to them too – animals explore the world with their mouths, after all. Houseplants Expert has a list of houseplants that are potentially toxic to your pets if they decide to chew on the leaves. If you have any breakable heirlooms, you can be sure that a cat will find a way of breaking them. 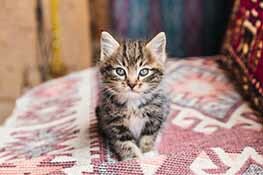 PetCareRx offers advice on cat-proofing anything delicate and valuable within your home. When the holidays arrive, your living room is likely to become a winter wonderland filled with festive trinkets and ornaments – all of which will be very tempting for an animal to investigate. VetIQ has a guide to decorating a room and keeping it safe for your pets. Your dog may well be cowering in your living room or bed on nights like the 4th of July, when anxiety-inducing fireworks fill the air. British TV personality and canine behavior specialist Victoria Stillwell has advice on combatting the panic that will follow. Open windows can be something of a risk for pets; whether that’s cats that attempt to leap from a great height, or birds that look to make their escape. If you must keep them open, look into some kind of shield to keep your pets safe. We may not spend quite as much time in our kitchens as other rooms in the house, but given half the chance a free-roaming pet would spend all day such surroundings. The smells alone are enough to hold the intrigue of any cat or dog! Always keep food out of reach of animals, and do what you can to mask any scents by using Tupperware or cling film, and ensure that cabinets that house cleaning supplies are very firmly closed. Trashcans can be irresistible to dogs in particular thanks to the smell of food within, and if a canine gets their face into a bin all kinds of trouble could follow as they swallow bones and rotten food. PetMD provides advice on how to pet-proof a garbage vessel. If a bin is enticing, just imagine how tempting it must be to try to gain access to a fridge! Thankfully, the blog me has a guide to keeping your snooping pets away from your leftovers and fresh produce. Most kitchens will be home to a wide variety of cleaning supplies, many of which will be lethal to animals. Eartheasy has compiled a list of the chemicals found in most houses that would cause problems for pets, and suggests alternatives that will be altogether less harmful. Leaf & Paw and The Honest Kitchen both warn of any common kitchen herbs that could harm an animal, while Cookware looks into general safety for animals in this room – including pet birds, which often call a family kitchen home. A bathroom is potentially the most lethal room in the house for any curious pet. Razors, medications and cleaning products should all be elevated away from the reach of an animal, and even toothpaste is lethal to dogs due to the toxic presence of fluoride within it. This doesn’t even begin to cover some animal’s tendency to drink out of the toilet! It’s best to keep a bathroom door closed as much as possible, as prevention is always better than cure. The truth is, there isn’t a great deal that can done to make a bathroom pet-safe other than keeping critters out of the area, and placing everything that could do them harm as far from their reach as possible. Also follow the instructions laid out for kitchen safety where applicable, such as those connected to cleaning supplies. Of course, pets also love to spend time in the great outdoors – it’s frankly a little mean to expect them to stay inside all day, every day. Even our own back yards are not entirely devoid of dangers, but with a little forethought your animals will be perfectly safe. The American Animal Hospital Association provides a no-nonsense guide to pet-proofing any yard to ensure safety for all, while Epic Gardening has a guide to creating the ultimate pet-safe outdoor space. It can get pretty hot in your yard during the summer. The American Kennel Club offers advice on how to spot the symptoms of dehydration in dogs, while Adventure Cats offers the same advice for feline family members. A variety of different plants are poisonous to cats and dogs – check with the ever-reputable PetMD for a complete list, and ensure that you remove such growths from your garden. You could also investigate a similar list from the ASPCA, and make sure that you follow the tips laid out by social network Care2. Anybody that keeps rabbits may want to let them roam free in their yard. The House of Animals investigates whether this is actually safe and advisable. If you plan of exercising your dog in the back yard, ensure you’re doing so safely by checking this guide from the Animal Medical Center of New York. If you live in particular areas of the country, you may need to worry about predators invading your garden and harming your pet. Barkley and Paws shares some insight on how you can protect your pets. If you’re looking for advice on pet-friendly pest control in the yard, this article from Scientific American has you covered. PetHub have advice on preventing something that none of us like to imagine – the theft of our treasured pets. This article from the Huffington Post also covers this subject in detail. There has been a great deal of information shared within this guide, and a number of backlinks provided. Don’t worry if you’ve lost track of a site that appeared to capture your imagination – here is a summary of all the sites that we have linked to throughout the course of the article.